It’s been a busy year for Laura Gordon at MTC. 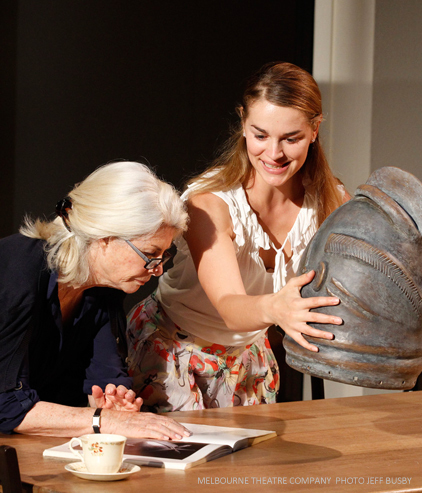 After appearing in Apologia earlier in the year, she returned to the Company for a short time in June as the understudy for Elizabeth Debicki in The Gift. Laura is currently playing the dual roles of Betsy and Lindsey in Bruce Norris’ offensively delicious hit Clybourne Park, and we chatted to her about preparing for the play. 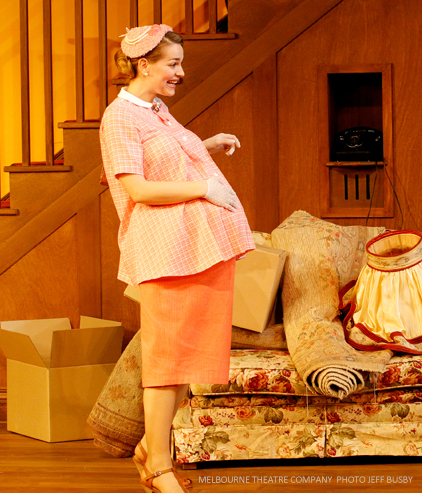 There are plenty of laughs on stage in Clybourne Park – was it the same in the rehearsal room? It was insane! Out of control funny. I think I laughed to the point of tears nearly every day of rehearsals. The first character you play in Clybourne Park, Betsy, is deaf. What research did you do in preparation for playing this role? I worked with our dialect coach, Anna McCrossin-Owen, to find Betsy’s voice.VicDeaf gave us some really helpful samples to watch which gave me a great understanding of what I was going for, and which I ended up using as a sort of prototype. VicDeaf also organised for someone to come out and teach us the American Sign Language that we use in the play. I certainly watched a lot of Marlee Matlin’s work in various films and TV shows! I found myself heavily relying on my sight and peripheral vision; scanning the room to see who is talking, or where people are looking. And people’s body language tells us so much of what they are conveying even if you can’t hear what they are saying. It’s been fun playing characters who are at different stages of their pregnancies. In the first act, Betsy is heavily pregnant, two weeks off her due date, so my ‘bump’ is enormous – so big, I nearly threw my back out the first time I wore it in rehearsals! Our stage manager is pregnant, so I followed her around and asked annoying questions. And now that her belly is starting to outgrow Betsy’s, I have to confess to a touch of ‘bump envy’. This is your second big role at MTC this year – how have you enjoyed your time so far? Any favourite moments? I’ve had a wonderful time at MTC this year, I feel very lucky. Acting opposite Robyn Nevin was definitely a highlight. Clybourne Park has been an absolute joy to do every night. The writing is superb and working with this ensemble of actors is so special. Do you have a dream role, or a particular actor or director you’d like to work with in the future? I’d love to do a Chekhov play, and maybe play a hard bitten private detective in a crazy noir thriller! I think the roles that scare me the most are the ones that I feel compelled to do. You can see Laura in Clybourne Park at the MTC Theatre, Sumner until 26 October.